Successfully Added Shot - Working Cell Phone and Camera (Dual SIM, Dual Band GSM) to your Shopping Cart. 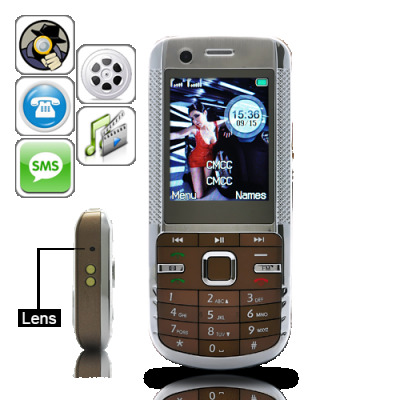 Introducing the Shot - Working Cell Phone and Camera (Dual SIM, Dual Band GSM), the next generation of gadgets. With a hidden top camera, a 2 inch touch screen, back camera, AND the ability to make phone calls, the Shot has it all. In addition to all the possibilities a product offers, photo captures, videos and voice recording, this Cell Phone Camera also has motion detection! A good feature for those who don't trust their colleagues or partners. They may search your stuff when you are away but no worries since you will be able to record them from now on! What more? The free 2GB micro SD card is big enough for storage of plenty of confidential data! Imaging this: Pretend you are dialing a number or typing a message, but actually you are secretly capturing what you are pointing at! Imagine you are climbing the stairs and there is a pretty girl wearing a mini skirt in front of you... then take the phone out and record the situation, while remaining unnoticed. No one will ever know what you are really doing! Whether you're a serious or just an amateur, the Shot is for you. If purchased separately the contents of this kit would easily approach $300. With this one, you save almost 70% and everything is compatible right out of the box! Available in our warehouse now, order today and we'll express ship it out tomorrow. Brought to you by the leader in wholesale electronics ... Chinavasion.